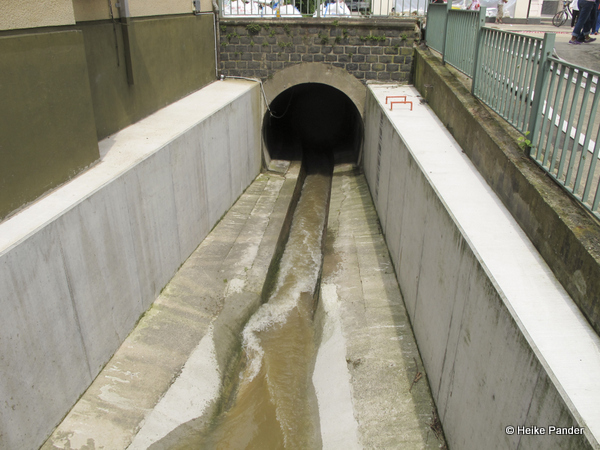 The Mehlemer brook is a small and inconspicuous rivulet, partly underground, and flows in an artificial river bed through the village of Mehlem in Bonn. 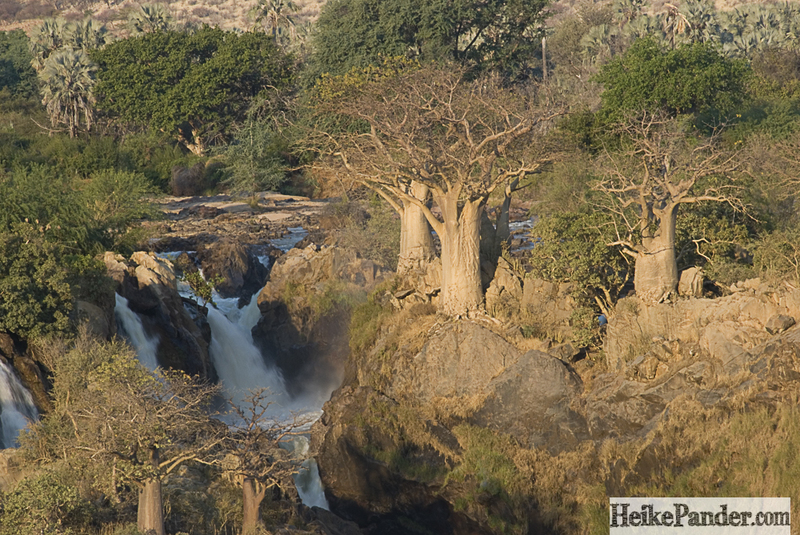 Last Saturday, the situation has changed abruptly: the brook turned into a torrent in a short time and flooded the village. The flodding occurred for the third time within a few years. Previous floods occurred in 2010 and 2013. Around 5 pm we were on our way to a party when we heard the sirens of fire trucks on the B9 on their way out of town. The previous thunderstorm had not been a bad one and the amounts of water that had come down seemed normal compared to what we had seen before. 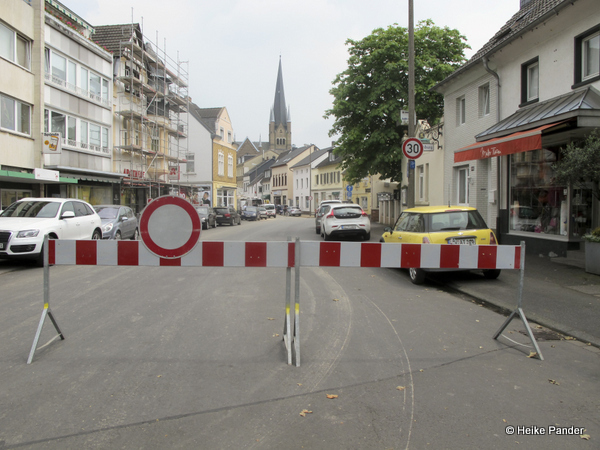 When we went to fetch bred rolls on Sunday morning we saw the mess: the road running through the village center and several other streets in Mehlem were closed off for traffic. Fire trucks and those of technical relief were parked everywhere. Large tubes were spread out and extra pumps were installed. Generators could be heard from far. They were pumping water out of full basements. Near the roadsides piles of rubbish accumulated. 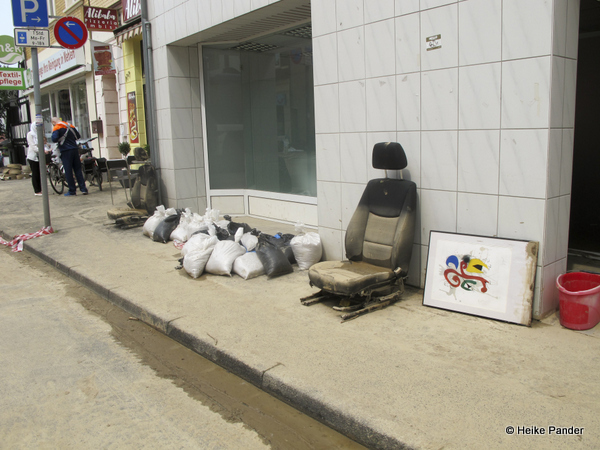 Soaking wet carpets next to ruined car seats and dripping wood – all waiting to be collected. This time the heavy rains had not hit Mehlem directly. The situation had developed in Wachtberg, another village on top of a hill. Torrential rains had come down, could not be channeled by local pipes and rushed down to Mehlem. The sewage system here failed, too. The old and narrow drains could not take in the water because they were full due to the backwater pressing in from the Rhine. 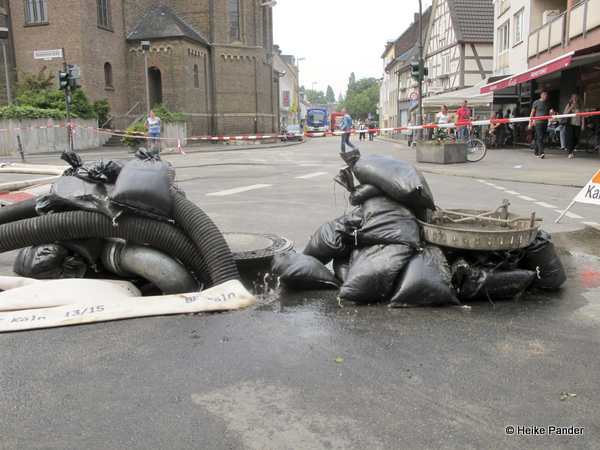 The pressure on the channels towards the Rhine increase and a crack in one of the pipes occurred near Rüdigerstrasse. There, the channels run underground. The water pressing out of the crack scoured underneath the houses nearby. Residents were evacuated on Saturday. Some could return to their homes on Sunday. The old canal system is no longer reliable and the municipality expects more damages to occur. The construction of a relief channel has started recently for Mehlem and the second phase is completed. But according to Mayor Sidharan the completion of the new system can only be expected in 2017. Until then the people in Mehlem have to watch out with every new thunderstorm building up. The old channel can only be repaired once the new channel has taken up its service. Then the water from the Mehlemer Bach will be diverted via the new channel into the Rhine. While people in Mehlem struggle through mud and water bravely, new thunderstorms can be seen building up in the sky. 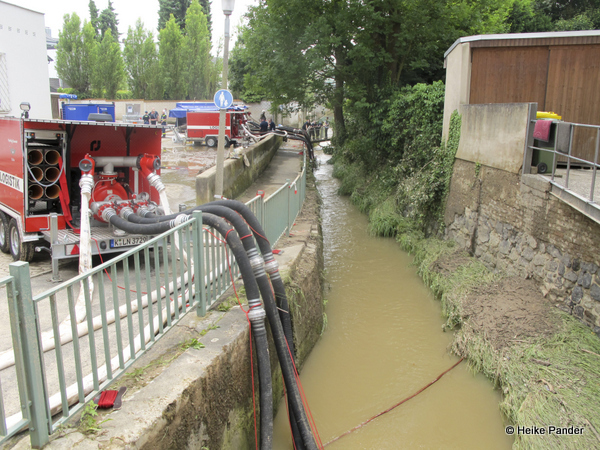 As a precaution, the fire department has installed more pumps in oder to reduce the pressure on the old channel system in the case of new flooding. Some local residents misinterpreted the activities of the fire department. 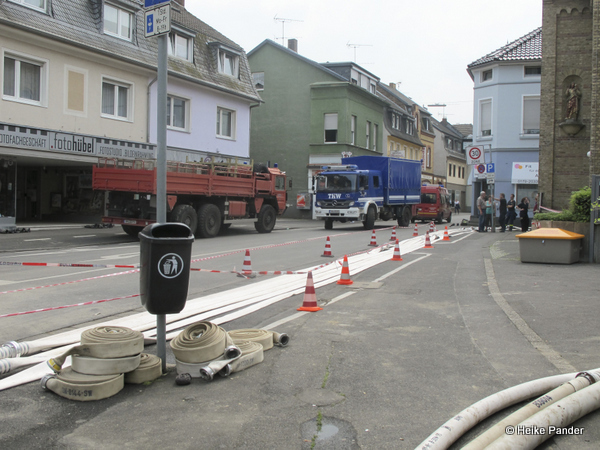 The rumor suddenly spread that the fire department intended to detour new floods into closeby Siegfriedstrasse to help the water flow into the Rhine. The fire department corrected the misunderstanding very quickly and explained that in case of need, the water would be dissipated through another underground channel, without compromising the residents. But rumors can be persistent. Therefore particularly sceptical neighbours took sandbags provided by the fire department which supposed to be used for other purposes. Those living next to the Mehlemer brook have had plenty of experience with floods in recent years. Resident Reinarz has therefore made a good investment. “The Mehlemer brook is not coming into my house again”, the senior says resolutely and adds “I have had flood protection installed”. When the water came back, he could take his vehicles out of the garage near the brook and could take them to a safe place. This year the water only flooeded his lawn in the garden. He was lucky. Although consturction work for the discharge channel has started in in the small park next to the Mehlemer center the people in Mehlem are not satisfied because the work does not succeed fast enough and they fear the next floods coming. They hope that with OB Sridharan having visited the scene that the construction work will proceed faster and work can be completed faster than intended. People are desperate for the new channel to bring long-awaited relief. Apart form Mehlem, Bad Godesberg was flooded, too. The Godesberger brook swelled after heavy rains in the Meckenheimer area and unexpectedly flooded its banks. The water flooded downtown Godesberg. Three people were injured. In addition to numerous cellars, the water filled the parking garage of the shopping center Fronhofer gallery. It broke in a power distribution station and caused short cuts. At times, the power supply for 1,000 households was interrupted. 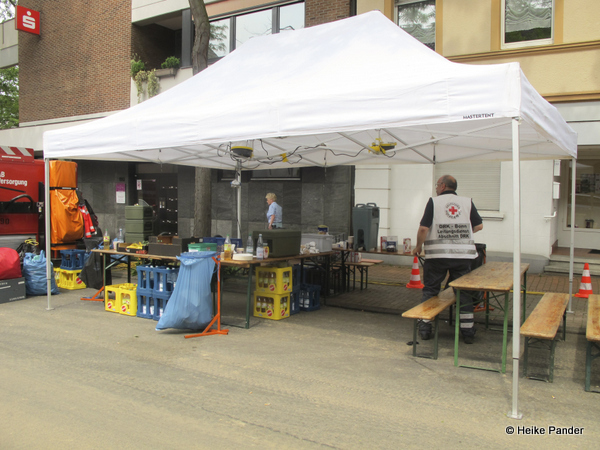 Up to 700 fire-fighters were on duty in Godesberg and Mehlem on Saturday and Sunday. The Red Cross distributed 600 helpings of hot dishes on Saturday and 500 breakfasts on Sunday. On Sunday afternoon, more thunderstorm warnings were issued for the entire area. 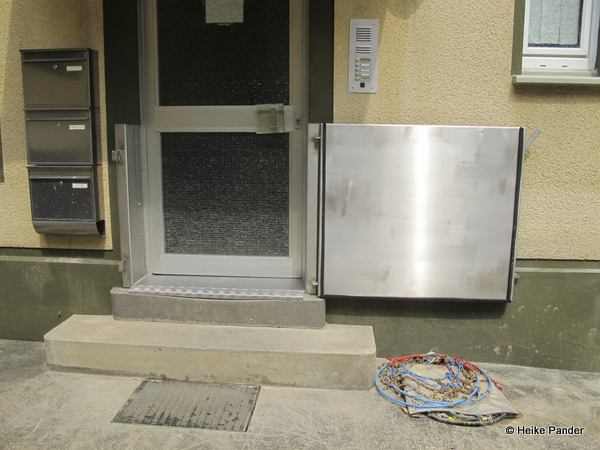 Business people and residents made arrangements – they shut off doors and shafts as best they could. The situation was tense, no one knew how bad things could turn. But Mehlem was not hit again. The thunderstoms and showers did not cause new floodings. On Monday, cleaning up is still in full swing. 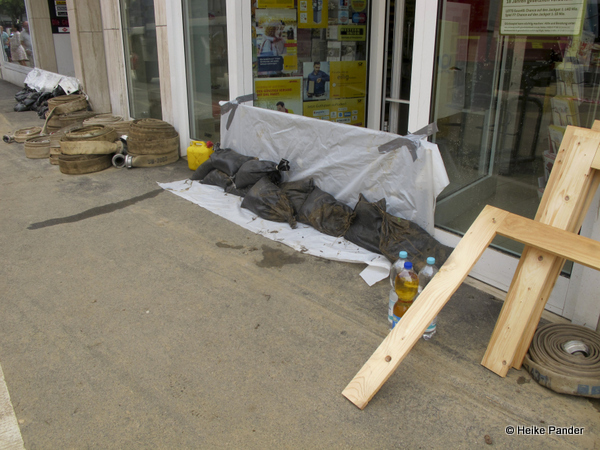 Some shops were closed as a precaution. 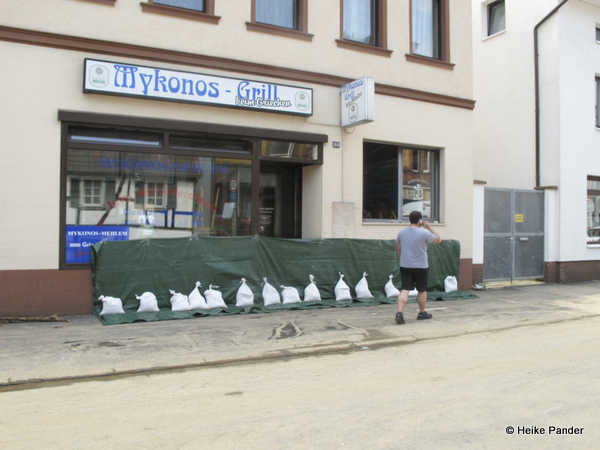 City maintenance people were busy removing the mudslide on Mainzer Straße. The firefighters are optimistic. They remain in Mehlem as long as the cleanup is ongoing. But they think they do not need to stay on afterwards, although new thunderstorms are expected in the afternoon. … and talking of which: the rain has just started and the first rumbles of thunder can be heard in the distance. We can only keep our fingers crossed that the area is safe this time. 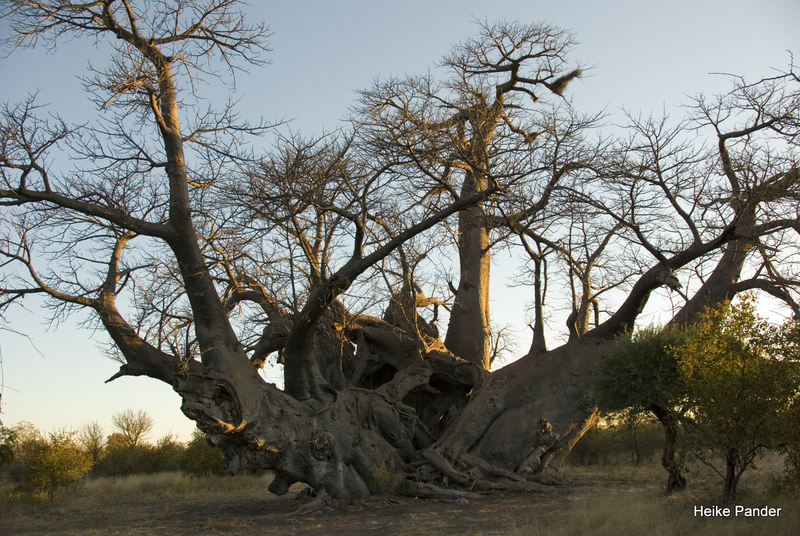 This entry was posted in Blog, Writing by Heike Pander. Bookmark the permalink. 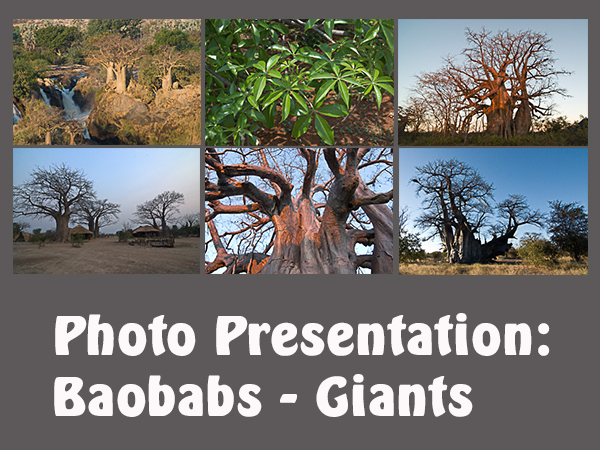 Photo Live Presentation about Baobabs in the Southern African Region. For more information click on the photo, please. 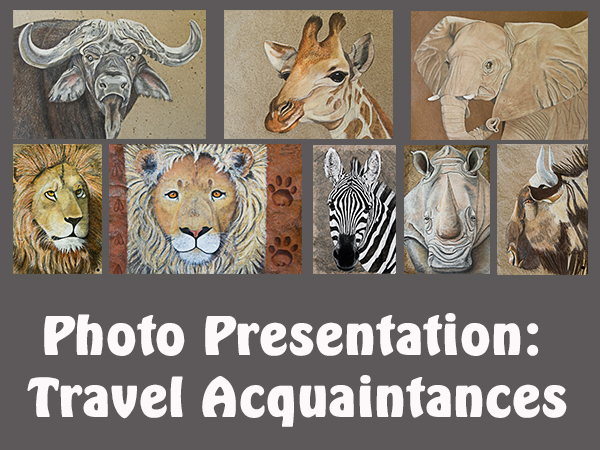 Photo-Live-Presentation about my nine-month Motorbike-Tour in the Southern African Region - including photographs and stories of baobabs and animals. For more information click on the photo, please.